Kusama adapts her 1966 installation Narcissus Garden to architect Philip Jonson’s sprawling Connecticut estate. 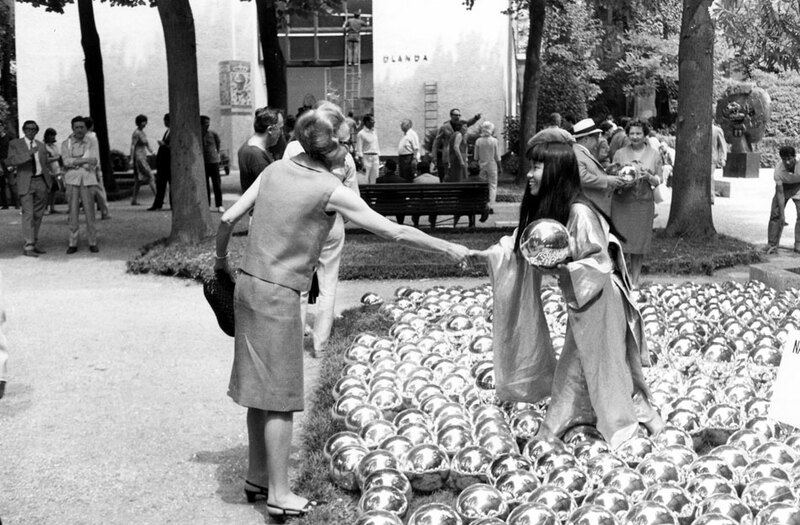 In 1966, at the 33rd Venice Biennale, Japanese artist Yayoi Kusama famously went rogue. Clad in a gold kimono, Kusama started selling off the 1,500 mirrored glass balls in her installation to visitors for 1200 Lire per piece. The Biennale organizers eventually put an end to her enterprise, but Narcissus Garden has become one her most famous works, exhibited recently at the Whitney Biennial in Central Park in 2004 and at the Jardin de Tuileries in Paris in 2010. Now, the installation has been adapted specifically for the 49-acre landscape of architect Philip Jonson’s Glass House in New Canaan, Connecticut, where it will be on view through November. For the installation, Kusama created 1,300 stainless steel spheres, 11 inches in diameter, that drift freely along the site’s heart-shaped pond. The installation will be on view through November 30, 2016, along with Kusama’s PUMPKIN installation on the east side of the property. The artist also created an infinity room for the Glass House, titled Dots Obsession-Alive, seeking for Eternal Hope, on view from September 1-26, 2016.